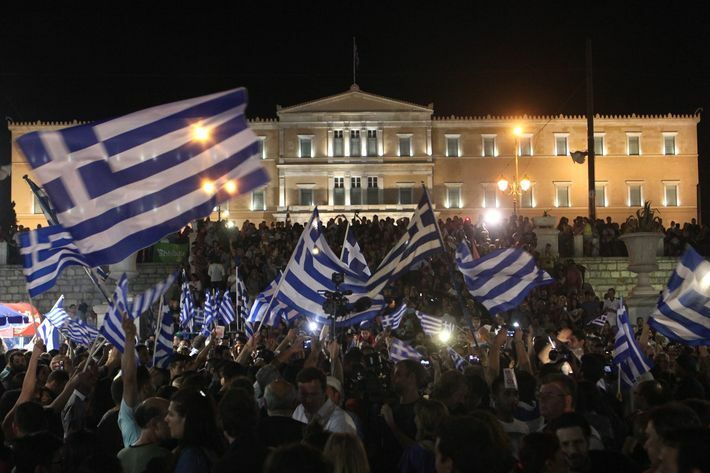 Many Greeks were celebrating on Sunday night after the nation voted to reject the terms of a bailout offer from its international creditors, which would have provided further loans to bolster the country’s flailing economy in exchange for additional austerity measures. With all precincts reporting, “No” won a higher than expected 61.31 percent of the vote, with “Yes” taking 38.69 percent, according to the Associated Press. 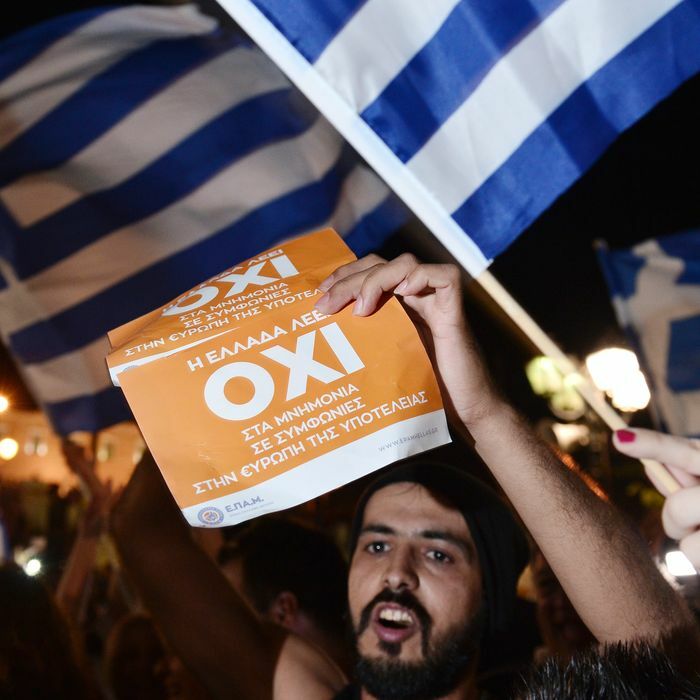 About 6.16 million Greeks, or 62.5 percent of eligible voters, took to the polls. The referendum is seen as a sharp rebuke of the policies imposed on Greece by other European leaders and the International Monetary Fund over the past few years — though since the bailout in question expired last week, it’s unclear what exactly they were voting for. Tsipras claimed he would be able to reach a new bailout deal with Europe within 48 hours, which many consider doubtful, but eurozone leaders have agreed to gather for an emergency meeting on Tuesday evening. They don’t have much time to hash out a new agreement. Last week Greece became the first developed country to miss a debt payment to the IMF, and it faces another major deadline on July 20, when it must repay a €3.5 billion to the European Central Bank. The even more pressing issue is whether Greek banks will run out of money. For months Greek banks have been kept afloat by emergency loans from the European Central Bank, but the ECB capped the amount of emergency cash available to Greek banks after negotiations fell apart last weekend. Greek banks have been closed since last Monday with ATM withdrawals limited to €60 in cash per day. Louka Katseli, the head of Greece’s banking association, said on Friday that Greek banks only have about €1 billion on hand and may not be able to reopen on Tuesday as promised. ECB officials plan to meet on Monday to determine whether they’ll continue to support Greek banks. According to the New York Times, the central bank’s rules say it cannot continue funding Greek banks if they are not solvent. The ECB’s leaders may try to find a way to continue providing emergency support to prevent further chaos in Greece, but if the nation is cut off it will likely be forced to return to the drachma or print another form of currency.